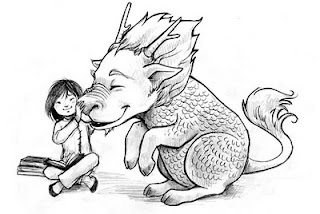 Qilin are gentle mythical creatures who bring prosperity and serenity. They originated from China and are often compared to the unicorn. They also happen to be one of my absolute favorite mythical creatures. They have the head of a dragon, horns of a deer, mane and tail of a lion, legs of an ox, and a body covered in fish scales. Really now, how can you beat that? Love these big guys. Wish I had one. Hi, Courtney. I stumbled upon your blog when I was looking for Qilin pictures on Google. LOVE your sketch! Wow, your artistic abilities are incredible, especially considering your young age (I'm 45, so I'm allowed to call you young, lol). Keep up the amazing work! You're definitely going places.